Defending a team with superior talent or a star player is always a challenge. There are a variety of junk defenses that can be tried in this situation, or a coach may simply choose to make some adjustments in his usual man-to-man or zone defenses. Whatever the situation, through good scouting, know what your opponent likes to do on offense and try to neutralize or take that away from them. Go for the heart…the heart of their offense, whether this is their fast break/secondary break, or a good low-post game, or good outside shooting. You probably won’t completely stop them, but if you can make them work harder, or go to a second or third option, you have a better chance. No matter what kind of defense you play, make the "star" player work hard, and not only for his shots on offense, but also make him play defense. Don’t let him rest on the defensive end. Take the ball at him and force him to play defense, and expose him to picking up some early fouls. If they try to protect him by using a zone defense against you, put your better shooters on his side of the floor, and try to get most of your shots in his "zone". If they play man-to-man, find out which one of your players he is guarding. As soon as the opponent shoots the ball, send this player down court on the quick breakaway. This may cause the "star" to drop back on defense, and not pursue the offensive rebound, and may be a constant worry to him, perhaps affecting his offensive play. If it is your style, and not his, fast break every opportunity to tire the star, and make him less of a factor than he is in a "half-court" game. On defense, know the "star's" tendencies. With a perimeter player who likes to drive to the hoop, or who is very quick, have your defender drop back an extra step. If he prefers going right, overplay him and force him left. If his main forte is outside shooting, deny and stay up tight on him. A low post player who likes the baseline drop step, take that away and force him to the lane. As coach, if you have confidence in your team’s man-to-man defensive ability and quickness, you might just consider some adjustments in your man defense. First, explain to the rest of the team, that the person who has the assignment of guarding the "star" will not be able to help out on team defense, as he must stay with the star at all times. Through good scouting, find out which of their offensive players is not a real scoring threat (usually not all five players are good shooters). Your player guarding this non-scorer can be positioned on the court to give help and double-team the star... I’ll call this player the "helper". The "star" is the point guard. See the Triangle Defense. Try to take him out of triple-threat position by forcing him to dribble. Try to keep him from penetrating. Have your "helper" set up at the top of the key, three-point arc area. By playing here, he will be able to help double team the star, or pick him up if he gets by your main defender. Also, try to confuse him…trap him the first couple times down the floor, then back off and don’t show the trap for a few minutes, and then do it again. Keep him off-balance. After trapping and forcing him to give up the ball, deny the pass back to him. The "star" is a wing-forward player. See the Triangle Defense. Try to deny him the ball. Stay between him and the ball ("on the line" --- see "Man-to-Man Pressure Defense"). Force him to back-cut into traffic, where your low post defenders can help out. (a) Box-out and keep him off the offensive boards. (b) Deny the pass to him. There are several components to this. The low post defender can three-quarter front him to keep the pass out. Your "helper" can front him. Your perimeter defenders must harass and guard the perimeter tightly to prevent the easy pass into the post. They must move their arms and feet and try to block the passing lanes. (c) One strategy is this: overplay his baseline so he cannot drop-step to the baseline. Force him to the lane, where your opposite wing defender will double team him. With this strategy, assuming the opponent's outside shooters are only average, I tell our wing defenders that when the ball is in the opposite low post, to drop down into the lane to help double team the star in the lane. If the star is able to recognize this, and is willing to make the pass off to the opposite wing, and if that wing player is able to make the shot consistently, we may have to change this strategy… but that's three "ifs"! First, several points about junk defenses, or combination defenses. 1. If your team is better than the other team, there is no need to use a junk defense. Just play your good man-to-man, or your good zone. 2. Do not base your entire season’s defensive plan on junk defenses. 3. If you use a junk defense, use it as a diversion, or something to confuse the enemy. 4. If you use a junk defense, realize it is a gamble, can often be easily beaten, and you must be willing to drop it quickly. This defense uses four defenders playing zone defense in the standard "box" set-up. Two defenders are on the low blocks, and two are up at the elbows. The fifth defender plays man-to-man defense against the star player. This defense may work best against a team with a good point-guard or perimeter player. Again, this defense will probably work best against a team with one exceptional perimeter player. In this case, three defenders play across the low blocks as they would in a 2-3 zone defense. The two low block defenders have corner and wing responsibilities. The "1" is set in the middle at the free-throw line, and is probably one of your quickest, best defenders. He has to cover from elbow to elbow above the free throw line, and try to contest the outside shot. Your best defender is the "chaser" who plays their "star" man-to-man. Good outside shooting teams can quickly rip apart this defense, but if the shots aren’t falling, this can be an effective defense. Opponents will usually counteract this by using a two-guard front in order to split the defender out front. If this happens, you can change to the "box and 1" (above). This defense can work well against a team with a good point guard, but only average low post play. It is essentially like a 1-3-1 zone defense, except that the chaser out front plays the point guard man-to- man, and the other four defenders play a 3-1 zone. This defense enables you to play the star point guard man-to-man, and still allows you to put pressure on the wing shooters and the high post. The low post is its weakness. This is about the opposite of the "1-3 and a chaser". Both can be used against a star point guard. You would consider using the "1-3 and a chaser" against the team with weak outside shooting and stronger inside post play. Use the "3-1 and a chaser" against the team with the star point guard and good outside shooting, but only average low post play. You can also consider alternating between these defenses. If you are in the "1-3 and a chaser" and they start hitting the outside shot, change to the "3-1 and a chaser". This defense would work best against a team whose star is an all around good athlete who not only plays the wings and corners, but will also go inside. Again, your chaser is your best defender, and plays man-to-man against this star player. The other four defenders are set up in a diamond formation and play this as a zone. The diamond consists of a defender at the point, two wing defenders and a low post, middle defender. This defense is weak in the high post area and corners. If you are getting burned in the high post, or the star goes out and plays the point, consider switching to the "3-1 and a chaser" (above). You can try this defense against a team with two excellent scorers and three average players. Two defenders play man-to-man against the two scorers. These may not necessarily be your best defenders, but quickness helps. The other three defenders play zone. 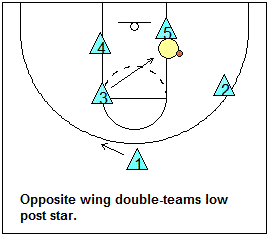 Two play on the low blocks and have corner responsibilities too. Your very best, quickest, hardest-working defender plays the middle position starting at the free-throw line. He must cover the free-throw line area and above. He must also cover the ball-side low block when the ball goes into the corner. If you are running the "triangle and 2" (above) and the offense splits the middle defender with a two-guard front, then one of your low block players moves up to the free-throw line. You now have an "inverted" triangle with two players at the elbows and one low in the lane.